Seeking more business for your practice, product or service? Join the PCA and find your next business development opportunity. With well over 1,000 members and growing every month, the PCA is the largest association representing the interests of the Keystone State’s Doctors of Chiropractic. For those companies planning to develop business with the Chiropractic profession, PCA is the go-to association in the Commonwealth. 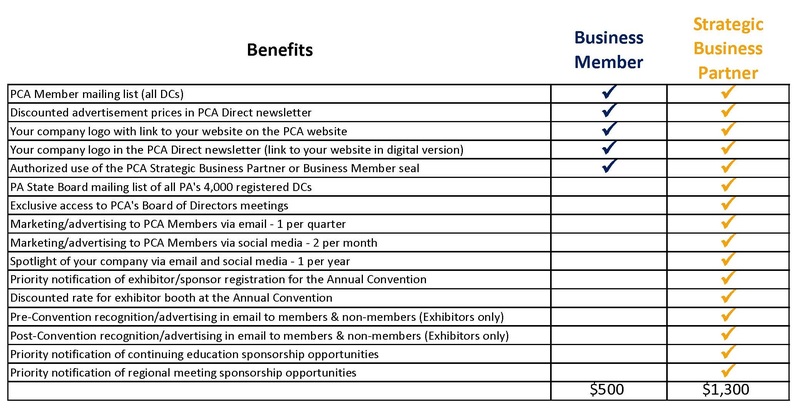 With access to Pennsylvania’s 4,000+ licensed Chiropractors, PCA offers our business affiliates a variety of benefits. Advertising opportunities can be found by clicking here. Check out how you can best utilize the PCA to generate more business leads and reach more qualified buyers in Pennsylvania!